The genius behind Roman Polanski’s film music is Krzysztof Komeda ! This is a photo of Krzysztof Komeda (1931-1969). He was a brilliant composer and jazzman. He is considered to be the “god father” of Polish jazz. He wrote music to some early Roman Polanski’s movies, such as: “Knife in the water”, “Cul-de-sac”, “Rosemary’s baby” and “Fearless vampire killers”. 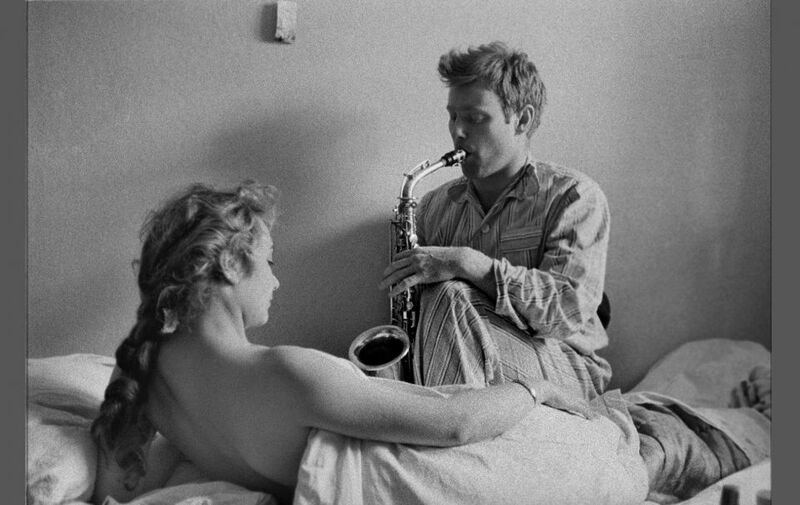 This picture is interesting because Komeda was a pianist, and here you can see him playing sax for his wife, Zofia. Picture was taken by Wojciech Plewiński. This is a generous contribution of Mateusz Witczak. Thank you Mateusz ! Next Next post: Hayao Miyazaki on how to make animated films !